A wiki is a repository of dynamically created and managed content, or content created or edited by multiple users collaboratively. 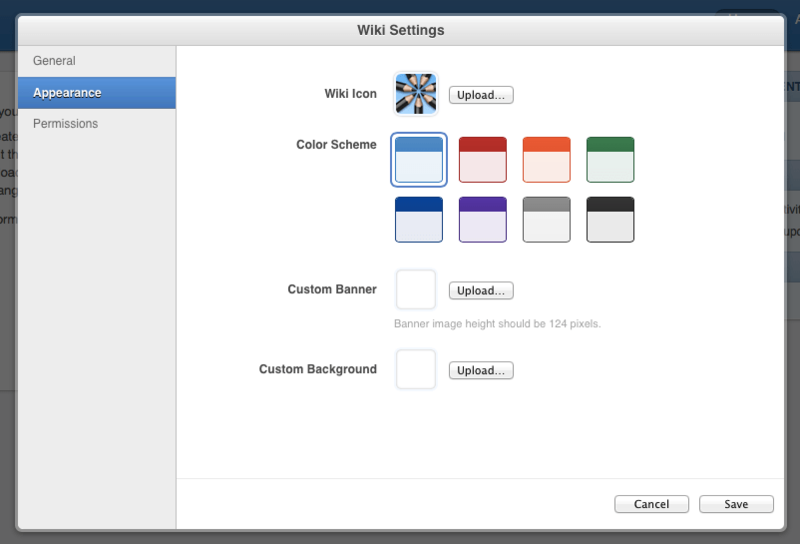 This article is about using the wiki service in Mavericks Server (OS X Server 3, running on 10.9). 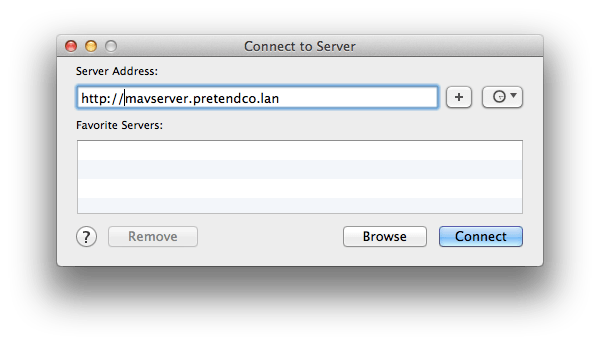 I reference file services with WebDAV because it is a very nice integration piece that I think a lot of people will find pretty beneficial. To get started with the Wiki service, first turn it on. This one isn’t heavily dependent on host names (other than being able to access the server from a browser) or directory services (other than being able to authenticate users, but local accounts are perfectly functional) and it doesn’t require the Websites service to be running as well. One should always have good working directory services and host names, still… To enable the service, open the Server app and click on Wiki in the list of SERVICES in the List Pane. There are two configuration options. The first is to select who is able to create wikis. 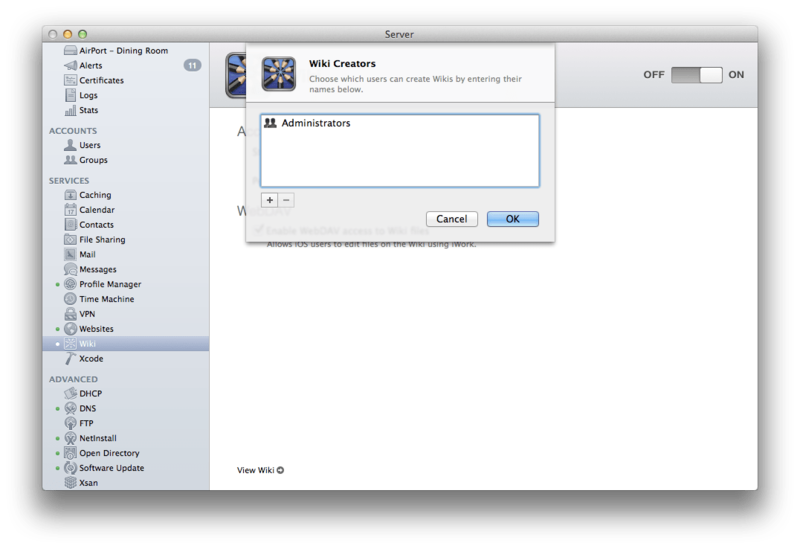 Use the “Wikis can be created by” drop-down list to select “all users” if anyone with an account on the server should be able to create a wiki or “only some users” to bring up the Wiki Creators screen. If only some users can create new wikis, use the plus sign (“+”) at the Wiki Creators screen to add users and/or groups to the list of users that can create wikis. 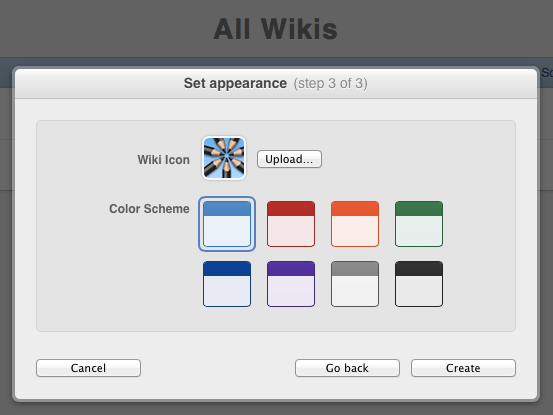 Click on OK when all users and groups that can create wikis are added. In a school I would imagine that only teachers or IT staff would be able to create wikis. Once a wiki is created, pages inside the wiki can still be created by non-wiki creators. 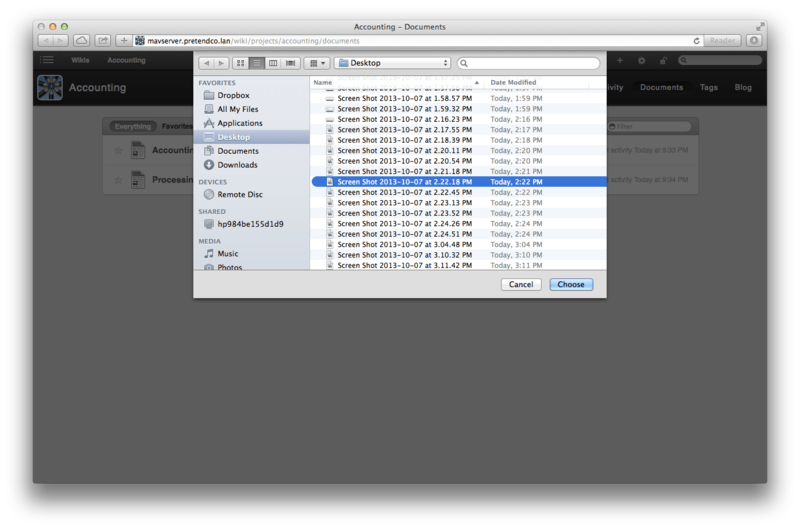 The other option available is the handy dandy WebDAV interface to the wikis. 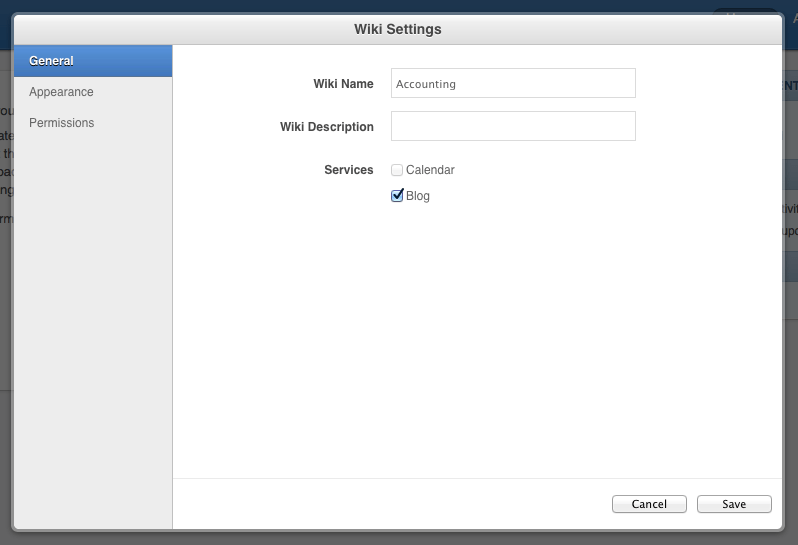 When you enable this option, you can connect to a server from OS X or iOS via WebDAV and access files in each wikis document repository. 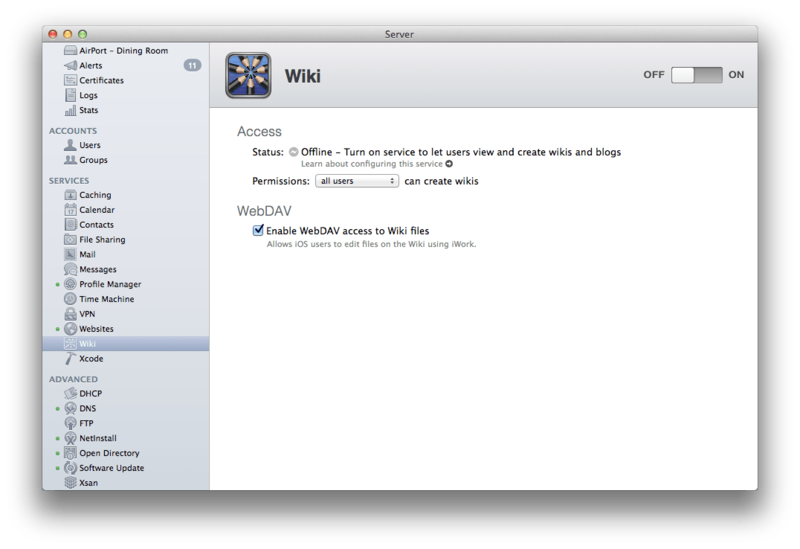 To be clear, this option doesn’t provide access to the user documents, but does provide access to the wiki documents. 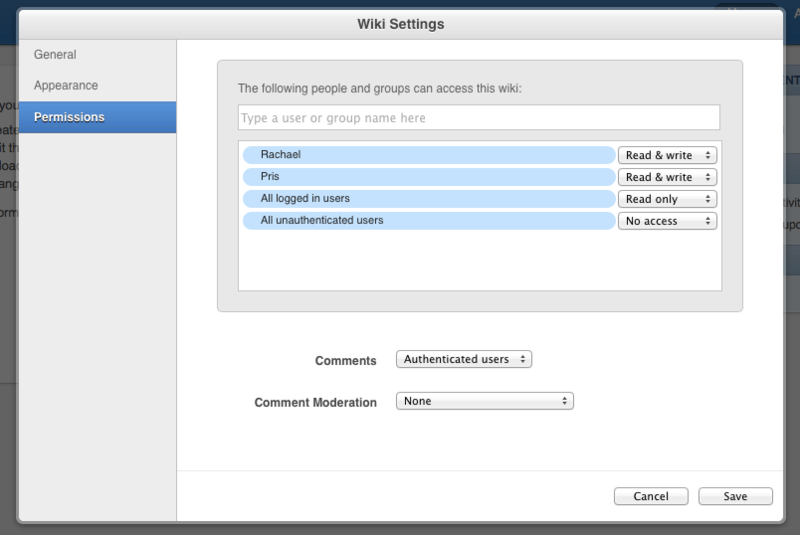 We’re going to check the box for “Enable WebDAV access to Wiki files” and then click the ON button. Once the service starts, click on the View Wiki link in the Wiki workspace in Server app. Here, click on the Log in button and enter a user with access to the server, preferably one who can create wikis. At the Wikis page, you will then see a list of all wikis you have access to. Note that the previous screen showed one wiki and now we see two. That’s because one of the wikis has permissions that allow “All unauthenticated users” access to the wiki, which we’ll describe shortly. The first thing most administrators will do is create a wiki. To do so, click on the plus sign (“+”) icon on the web page and at the resultant screen, click on New Wiki. 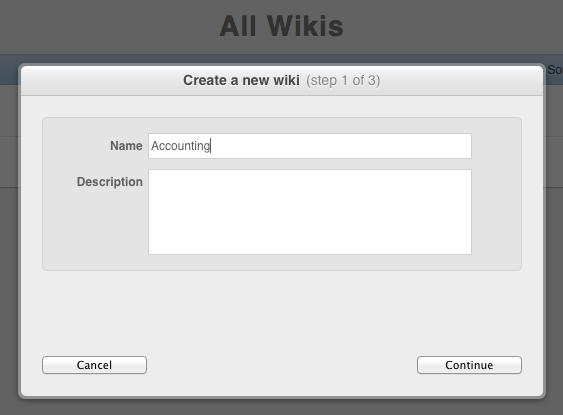 At the “Create a new wiki” prompt, provide a name for the wiki and a brief description for it. Click on Continue. 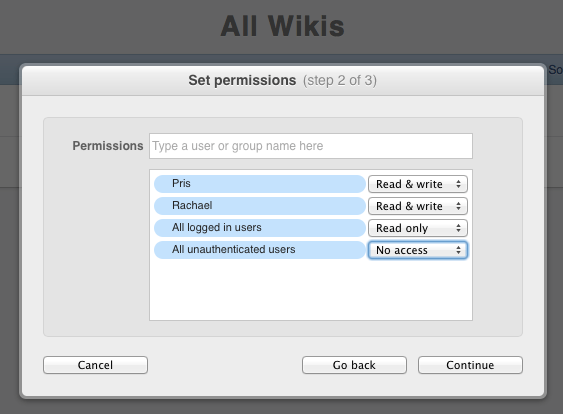 At the Set permissions screen, enter each user or group to provide access to edit and view wiki pages. Here, you’ll have the options for Read & Write (users can view and edit pages in the wiki), Read only (users can only view the contents of your pages) and No access (users have no access to the wiki). There is a group for All logged in users, which includes every user with access to the server and another for All unauthorized users, which includes guests to the server. 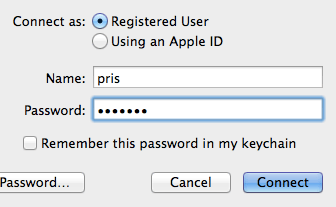 Once you’ve given the appropriate permissions, click on Continue. Note: You don’t have to get this perfect now as you can always edit these later. Note: Use Enter URL to link to an existing page or an external website, instead of creating a new page.